If the pint of beer is the trusty pick-up truck, and the craft cocktail the luxe town car, the daiquiri must be the crotch rocket speed bike – bright, loud, kind of crass and, even for those who profess to disapprove, unquestionably thrilling once you take the ride. The punch line of the drinks world elsewhere, the daiquiri has long enjoyed special status in southeast Louisiana. Daiquiris can be just the foil for a hot day in the semi-tropics, though the appeal is not limited to summer (for some people I know, Christmastime in New Orleans tastes like egg nog daiquiris). We sip them at the multiplex cinema and when picking up out-of-towners at the airport a stop at one of our notorious drive-thru daiquiri shops in the ‘burbs always makes a memorable impression. These drinks have worked their way into modern New Orleans culture. We don’t go to the “daiquiri bar” in New Orleans, after all, but to the daiquiri shop, like it’s some boutique. There’s even now the New Orleans Daiquiri Festival, which is coming around again Aug. 17 for its third edition. Organizers maintain something like a daily devotional to the daiquiri on its Facebook page. Of course, some may still regard icy, boozy drinks as a highway to headaches, but daiquiris these days are not just about the Mudslide or 190 Octane. The locally distilled Old New Orleans Rum fuels the drinks at the Daiquiri Festival, for instance, where local bartenders put their own spin on the drink. And the daiquiri has been turning up at more bars and even a few restaurants. When the gastropub St. Lawrence opened in the French Quarter last year, the owners kept the daiquiri dispensers left behind by the previous operators. Instead of the usual commercial daiquiri mixes, however, the St. Lawrence crew batches up a Pimm’s Cup daiquiri and other flavors (lately a Louisiana muscadine white sangria), which swirl away behind the bar. The icy action is a little more discreet at the Rusty Nail in the Warehouse District, but just ask for a frozen Pimm’s Cup and the bartender will pour one into Styrofoam from a small machine tucked away in the back room. Farther downtown, Booty’s serves a frozen blend of rum, juices and bitters as its Bywater Bomber. At the Saint in the Lower Garden District, the swirling machines dispense margaritas and a frozen whiskey and Coke. 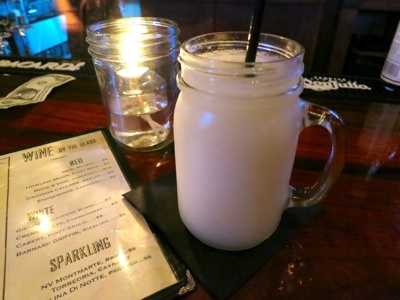 Publiq House, a new bar and music venue on Freret Street, has embraced this new-school daiquiri trend more fully than anyone in town. They call them “frozen cocktails,” and there’s a whole list of them on the drinks menu and two banks of daiquiri dispensers lining the bar. These drinks tend to be slow sippers, if for no other reason than to avoid a frozen palate. That’s fortunate, because they also tend to be pretty strong. For a little extra kick, remember the frozen Irish coffee that has long been a calling card of Molly’s at the Market and Erin Rose in the French Quarter and, more recently, a icy addition at Finn McCool’s Irish Pub in Mid-City. We’ve made it to August in another New Orleans summer. I’d say that calls for a daiquiri.